Michelle LeFebvre has spent several years conducting fieldwork on Carriacou, a Grenadine island in the Lesser Antilles. All work on Carriacou has been a multi-institution effort, with Principle Investigators Scott Fitzpatrick (University of Oregon), Quetta Kaye (University College London) and Michiel Kappers (IN-TERRIS, Netherlands). Michelle’s MA research and continued work focuses on identifying patterns of vertebrate exploitation at the Grand Bay site. Current results indicate small-sized fish were common targets of fishing near the end of site occupation (LeFebvre 2007). In collaboration with Christina Giovas (Department of Anthropology, University of Washington) and Scott Fitzpatrick, Michelle is also investigating the human translocation of South American mammals to the Caribbean islands (Giovas et. al 2012). LeFebvre, M.J. 2007. 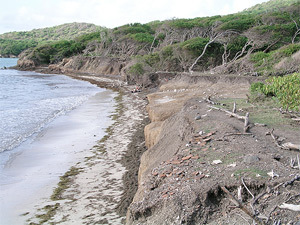 Zooarchaeological Analysis of Prehistoric Vertebrate Exploitation at the Grand Bay Site, Carriacou, West Indies. Coral Reefs 26(4): 931-944. Giovas, C.M., LeFebvre, M.J., and S.M. Fitzpatrick 2012. New Records for Prehistoric Introduction of Neotropical Mammals to the West Indies: evidence from Carriacou, West Indies. Journal of Biogeography 39(3):476-487.